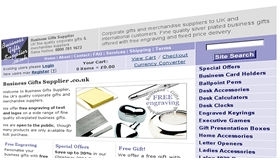 In 2002 Digital Acla launched its flagship site, Business-Gifts-Supplier.co.uk. The client for this e-commerce site recouped his investment via online sales within six months of launch. Since then the site has undergone several revamps and currently offers over 300 products. In October 2002, Digital Acla launched Business-Gifts-Supplier.co.uk, a new Web site for a Scottish-based corporate gifts and merchandise suppliers. This large site incorporates a shopping cart facility, site search function, a recommend-a-colleague feature for each product and online order form. Since then the site has evolved to include a database-driven products catalog, customers and orders database, and secure checkout facility. The product catalogue for this Web site currently stretches to some 300 pages of silver plated gift items, ranging from desk accessories and business card cases to silverplated ballpoint pens and silver plated photo frames. All of the products are suitable for engraving and the site offers facilities for customers to specify text engraving, and to upload their logos for engraving, for each product ordered. One of the most popular pages on the site is the Special Offers section, which can be updated easily by the owner using a secure back-office facility. Discounts are assigned in the back-office and are automatically propagated across the site. Digital Acla works closely with the client on this project to refine the propositions for customers, including the introduction of free engraving and fixed price delivery. To see this site in action, we recommend you start at the first section, silverplated business card holders, and proceed as far as checkout. Its as smooth and user-friendly as any e-commerce site we have visited.